2016 commercial seafood landings (edible and industrial) by U.S. fishermen at ports in the 50 states totaled 9.6 billion pounds, valued at $5.3 billion, according to NOAA Fisheries’ Fisheries of the United States, 2016. The volume of landings decreased by 145.6 million pounds (down 1.5%) while value increased $108.7 million (up 2.1%) compared with 2015. The highest value commercial species were lobster ($723 million), crabs ($704 million), scallops ($488 million), shrimp ($483 million), salmon ($420 million), and Alaska walleye pollock ($417 million). 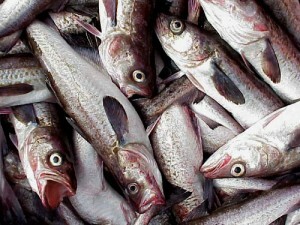 The largest U.S. commercial fishery by volume remains Alaska walleye pollock, which showed near record landings of 3.4 billion pounds, representing 35 percent of total U.S. commercial and recreational seafood landings. Finfish accounted for 88 percent of the total landings, but only 43 percent of the value. The 2016 average ex-vessel price paid to fishermen was 55 cents per pound, an increase of 1 cent per pound vs. 2015. Alaska led all states in volume with landings of 5.6 billion pounds, followed by: Louisiana, 1.2 billion pounds; Washington, 551.9 million pounds; Virginia, 363.3 million pounds; and Mississippi, 304.0 million pounds. Alaska led all states in value of landings with $1.6 billion, followed by: Maine, $633.6 million; Massachusetts, $552.2 million; Louisiana, $407.2 million; and Washington, $321.0 million. Dutch Harbor, Alaska, was the leading U.S. port in quantity of commercial fishery landings, followed by: Aleutian Islands (Other), Alaska; Empire-Venice, Louisiana; Kodiak, Alaska; and Reedville, VA.
New Bedford, Massachusetts was the leading U.S. port in terms of value, followed by: Dutch Harbor, Alaska; Empire-Venice, Louisiana; Naknek, Alaska; and Kodiak, Alaska. Commercial landings by U.S. fishermen at ports outside the 50 states provided an additional 420.4 million pounds (190,707 metric tons) valued at $277 million. This was a decrease of 23 percent, or 128 million pounds (57,912 metric tons) in quantity and a decrease of $7.2 million (2.5%) in value compared with 2015.